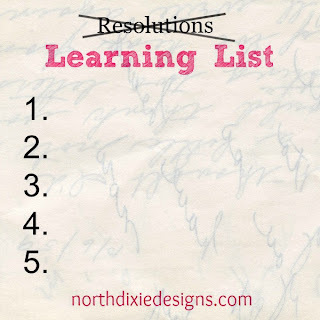 Making a Learning List is on my to-do list for January. 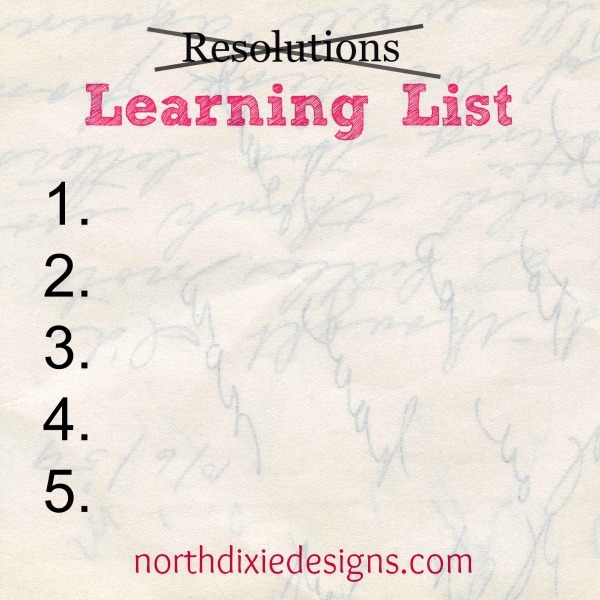 I make Learning Lists instead of a resolutions list. Resolutions seem to be short-lived and deficit based, whereas a learning list has a positive open spin. Learning is life-long and the spice of life. I see this learning list as my ticket to FUN. My Learning List is often based around art techniques, but sometimes it is about a homemaking skill. Sometimes they're related to my main art focus and other times it's just plain old fun and curiosity. Year before last learning about making gelatin prints was on the list. We had an "art party" and invited some friends over. Last year I wanted to learn about fabric design (this is carrying over to 2013). I try to keep the "shoulds" off my list because then it becomes a burden of musts rather than an invitation to have some fun. Fabric Designs - continue learning. It's important to not put too many things on the Learning List. A list of about 5 things is pretty good. After you make the list, you decide on which thing to do first. Keep it fun. I asked the Maida Dolls Group to share doll making skills they'd like to learn for 2013. They have a pretty good inspiring discussion going on here. If you're not a member of the Maida Dolls Group, it's free and open to anyone who would like to learn about doll making. My learning list consists of the challenge of making a bustle form, and a 'uniform' bustle dress ensemble that will fit a variety of different sized and shaped persons. Which is a challenge because these garments were always specifically fit to their owner, and typically, one couldn't just borrow and 'fit' in another gal's dress back then. Our museum "The Whaley House" is shifting it's period clothing focus from Civil War to the early 1870's, the early bustle period. I've been spending lots of time researching and trying to sort out the best way to accomodate the need for one garment to fit at least 2 people. It's taken my time away from making my dolls to be sure. But the dolls aren't going to pay my bills, it's just too time consuming to make them and I have come to accept the fact that too many people are making them, and the excitement of acquiring the Izannah style artist dolls has definitely waned and it's time to move on to something new. Everyone wants to make and sell them, rather than buy one. That presents an economic issue, affects supply and demand. I will probably only make a few more, for family and friends, and call it a day. Maybe come up with my 'own' dolls at some point down the road. I only hope that someday, in about 40 years, people rediscover Izannah art dolls a'la Helen Pringle and get excited if one of mine turn up somewhere. One can dream, right? I also lost 125lbs this last year. In the last 6 months, between my son's wedding, sister's 50th birthday party, Halloween parties, Thanksgiving, Christmas and my last two weeks spent indulging in New Orleans, I've gained back 30lbs. So yesterday, I began my 'learning list' of improved behavior to thwart the gaining and begin to either accept and maintain where I am, or to work slowly on the removal of those extra 30lbs. Decided NOT to just 'wait' until the New Year to make a resolution. That never works for me. This isn't a resolution, it's a quality of life issue and waiting won't fix it. So I'm 'learning' not to wait for the end of the year to make a meaningful change. Deciding how to focus our time as an art business is always a balancing act. Yes, there are many people making lovely (lovely!) Izannah Walker inspired dolls - yours included. I think it would be really fun to do a collection of dolls made by these people. I agree that collecting Helen Pringle, Edyth O'Neill, Judie Tasch dolls would be fun, too. Lots to think about.